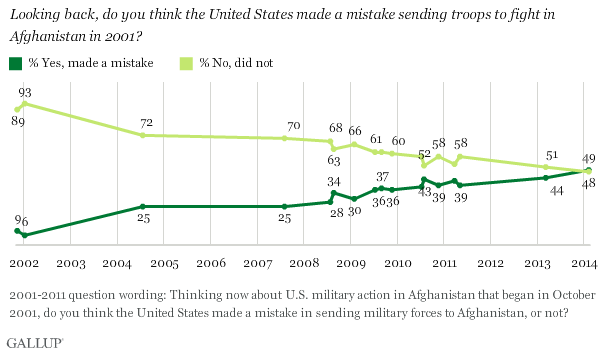 For the first time since the U.S. initially became involved in Afghanistan in 2001, Americans are as likely to say U.S. military involvement there was a mistake as to say it was not. •	Although only one in five Americans in the late summer of 1950 initially thought U.S.
involvement in Korea was a mistake, less than six months later — after the Chinese Communists had poured over the Yalu River into North Korea, turning the war into a bloody stalemate — attitudes shifted dramatically: 49% said U.S. involvement was a mistake, while 38% said it was not. 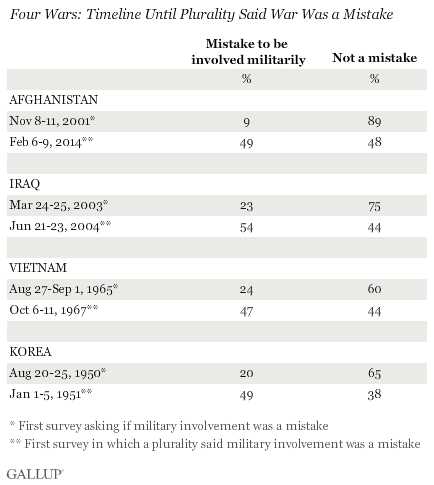 •	Gallup first asked Americans about the Vietnam War in late August/early September 1965, with 24% saying military involvement there was a mistake. A little more than two years later, in October 1967, as U.S. troop presence and casualties in that war escalated rapidly, 47% viewed involvement there as a mistake, compared with 44% who did not. •	And it took just a year and three months from the March 2003 start of the Iraq war for a plurality of Americans to first say involvement there was a mistake, although opinions about that war fluctuated until late 2005, after which they were more consistently negative. A real estate tycoon was in the headlines last year in Pakistan. His legendary rise from rags to riches in less than 15 years, by virtue of many things controversial, was also reported when Mediagate gripped the country. But hardly any rags-to-riches story is ever free of controversy. While all the feudal lords in the country (many of them pirs) came to possess their mega-estates post-1857, the notorious ‘22 families’ have amassed phenomenal wealth and properties by employing the most foul means: tax evasion, thug violence, bribes, family connection, jobbery and what not. This is not Pakistan-specific. This is a universal rule. However, in the west plunder is institutionalised and sophisticated. In the post-colonial world, plunder is crude and berserk. Still, from cradle to grave we are constantly fed the myth that if we work hard, we succeed. By success one often means ‘wealth’. However, this oft-repeated cliché does not explain why millions of peasants remain poor even when they have been working hard, all year around, for the last many centuries. One may also say the same about millions of workers. Generations of working class families have been working hard in mines, factories, construction sites and other work places. But they remain dirt poor. As a matter of fact, under capitalism (as was the case with feudalism) one does not become rich by virtue of his/her hard ‘work’. One is rich (capitalist) or dispossessed (worker) owing to one’s class positioning. Class is not a group of people. Similarly, capital is not currency, wealth, property, or land. Say Mr Rich invests Rs100 in a towel producing factory. He installs machines and employs workers to do the job. Every time a production cycle is complete, Mr Rich pockets Rs10 as profit. Under capitalism, this profit will never be appropriated by the workers, no matter how hard they work to produce the fine quality towels. It is possible that an ‘intelligent’ (most likely an obedient) worker is promoted as foreman to help police and discipline his comrades. Still, this ‘intelligent’ worker will only be a ladder above his comrades but will never continue to rise in riches the way the top boss multiplies his wealth by pocketing Rs10 as profit every time the production cycle is completed. To further protect his accumulated profit, Mr Rich doles out a fraction of his profit (Rs10) to income tax officials to evade tax. He also bribes other state officials and politicians. Thus, he ensures that the state is on his side if the workers ever organise in unions to demand a share in the Rs10 they produce as profit. Had there been a link between hard work and wealth, billions of peasants and workers toiling from dawn to dusk would not have been living in absolute misery. The minimum wage in Pakistan is Rs6000 (though this law is hardly respected anywhere). Suppose a worker is paid the minimum wage and he lives on thin air to save every single penny, still it will take him 15 years to earn his first million. How many do you think will manage such a miracle? Mom said, “No darling, he must pay for his mistake. I am coming to live with you”. The men put the boxes in a van and weaved through the Polish capital until coming to the headquarters of Polish intelligence. They were met by Col. ¬Andrzej Derlatka, deputy chief of the intelligence service, and two of his associates. In March 2003, Khalid Sheik Mohammed was captured in the Pakistani city of Rawalpindi and brought to Poland. He proved difficult to break, even when water¬boarded, according to several former CIA officials. Mohammed would count off the seconds, between 20 and 40, knowing that the simulated drowning always ended within a certain period.